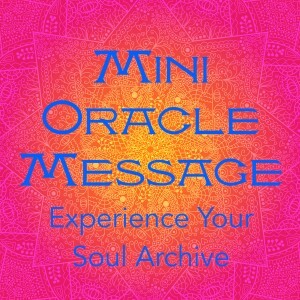 When you feel like getting Divine Guidance from the Akashic Records and are willing to take your Record Keepers’ word for what the absolute most important thing for you to know right now from your soul archive is, then the Mini Oracle Message is for you. The Mini Oracle Message is designed to give you a shove in the right direction, like a shot of Divine Wisdom and energy, to launch yourself more deeply into the Age of Enlightenment in a place of perfect alignment. It’s a short recorded phone call in which I’ll channel a message from the Keepers of your Records: it will be a message of their choice, and will always be exactly that which you most need to know at the moment of the Message. Please note that unlike my usual Oracle Consultation, you do NOT get to ask questions: your personal Record Keepers decide for you the topic of your message. Once the message is transmitted, you may of course ask as many clarifying questions as you require. If you have specific, burning questions about one or more areas of your life or business, you’ll want to do the Oracle Consultation, which is about 2 hours long including the integration call the following day. Expect this call to run 40 minutes max, including on-the-spot integration and strategizing. Whether you just want to dip a toe into doing the powerful, transformational Oracle work with me, or you just feel like you need an energetic re-boot, the Mini Oracle Message is just the ticket. After payment is made, you’ll be sent a link to schedule your call as well as instructions for the call itself.